So if I can get through the slow beginning, the payoff at the end is worth it? 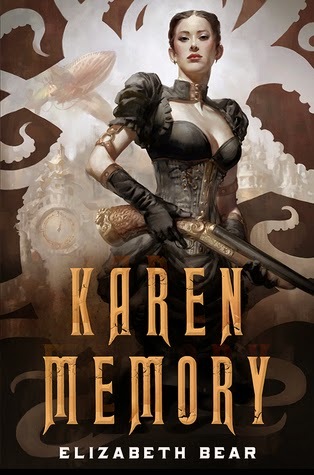 The slow beginning isn't a problem by itself, Alex, because Karen's voice is so fascinating in drawing you into her frontier, steampunk world. It's just that the shift in pacing is a bit jarring. Plus slow beginning is all relative seeing how there is a murder in the first two chapters! Glad you enjoyed it too, I always wait for the person who breaks out against the hype. So far, not found it. This is on my wish list. I am hoping my local library gets a copy so I don't have to buy. This looks like such an awesome book. I think I would be OK withe pacing, especially considering all the goodness you get in the story and characters. I enjoyed getting to know Karen's character in the first half, but definitely preferred the second half. I struggled with the dialog some, but since I feel like it is such an integral/defining piece of who Karen is, I can't complain. It just slowed me down. I only found the dialogue/narration challenging for the first chapter or two. Once I settled in, I almost stopped noticing it. Glad you enjoyed this. For me, it was almost a five star read, but I felt much the same as you regarding the pacing. I'm so excited to get started on this, I have a copy but I do have a couple of review books that need to get read before I can dive into this one. Glad you're another satisfied customer! I generally hate slow beginnings (I've noticed that a lot of writers need up to 100 first pages to start the story) but the rest sounds lovely!